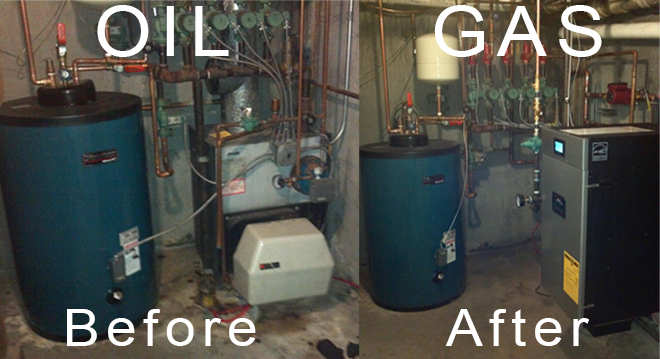 Alan Feldman Plumbing & Heating Corp will come in and update your current oil heating system to a new, energy-efficient, cleaner natural gas system. There has never been a better time for customers to convert from oil heat to natural gas. While many customers are aware that natural gas heat provides greater dependability, versatility, cleanliness, and convenience, they may not be aware of the significant savings it provides. A typical Oil to Gas Conversion will pay for itself in about 2 years. BETTER FOR THE ENVIRONMENT: Natural gas is cleaner than oil, which means less carbon emissions are released into the air. MORE CONVENIENT: Natural Gas flows directly into your home from an underground pipeline, so customers will not have to worry about arranging deliveries. BURNS CLEANER: With natural gas there are no odors, soot, or fumes to clean or inhale. PROVIDES DEPENDABILITY: Natural gas is a reliable, AMERICAN-made resource. SERVICE WITHOUT ELECTRICITY: Some natural gas appliances operate during a power outage, so customers may continue to stay warm, cook meals, and have hot water. *Facts, figures, graphs, and some content courtesy of National Grid.